You all know it's coming....wait for it...BACK TO SCHOOL time is just around the corner! All good things must come to an end, right?? That being said, I started thinking about important items that I wanted to cover with my students over the first couple weeks of school. My classroom is almost 100% paperless, so I knew that I wanted to introduce my students to technology almost immediately. Keeping that in mind, I decided to create a Back to School Breakout- Digital Escape Room. 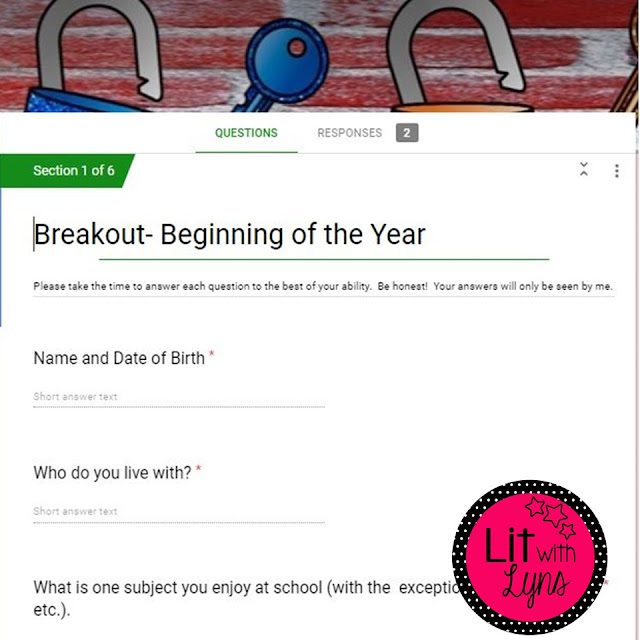 I became obsessed with using Digital Breakouts over the last year and shared this with you when I used an escape room for ELA Test Prep. If your students have never completed a breakout before, you may want to explain what this is. Digital Escape Rooms are based on escape rooms and involve students trying to use clues to crack multiple codes in a certain amount of time. I'm usually pretty flexible with the time, but they can typically take about 45-60 minutes in my experience. To begin, students will go to a Google Form, where they will complete the Beginning of the Year Student Survey. Students will be asked a series of questions which will allow you to get to know their interests, likes, dislikes, how well they understand and can use technology, etc. Then once they get to the last question, they will be required to click on a link, which will take them to a jigsaw puzzle. Here, they must put the puzzle together correctly, and once they do, they will see the code. They will be directed to enter the code on the Google Form. Once they enter it incorrectly, they will be taken to the second escape "room." In the 2nd escape room, they will be given a link to a video on tips for having a successful school year. At the end of the video, they will be given the next code that must be entered in order to move on to escape room 3. The final challenge is to watch a video on setting SMART Goals. I love introducing this at the beginning of the year, because this is something I refer to often. My students update their SMART goals every quarter and modify them as necessary. At the end of the video, they are directed to go to the Google Form and follow the directions in order to proceed. On the Google Form, they are told to click a link in order to figure out what the code is. The link will take them to a fake plane ticket. On the plane ticket, they are directed to look for a *hint that will help them with the final code. Once they figure the code out and enter correctly, a "CONGRATULATIONS" message is displayed. This is a great way to get your students thinking right off the bat, while also being able to learn more about them, as well. The best part about using Google Forms to have students input information about themselves is that it automatically saves to your Google Drive in a spreadsheet! Each question is displayed, along with the students' names and their answers. That means that you can refer to the info gathered at any time throughout the year. What are your back to school staples? I'd love to hear about them in the comments! I LOVE this. I have done escape rooms to review for assessments and also to have them complete surveys that needed to be done for school. This is such a great way to start off the year. My escape room codes lead them to a padlocked box and they have to figure out the combination to get in where they find a small prize.